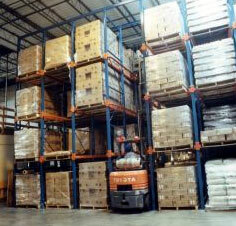 While boltless pallet rack serves many applications, the extra strength and safety of a bolted connection is sometimes desirable. Drive-in, pushback, die storage, coil storage, or flow rack installations may utilize bolted connections to add security to the rack structure. For these installations, we recommend bolt connection pallet rack. Bolted rack columns are constructed of closed structural tubing. This allows for 44 times more resistance to torsional fork truck impact loads than "roll formed" columns. Fully adjustable with 2" vertical increments for beam placement. Limited adjustability also available. Holes are placed on the column's sides, not the corners, minimizing strength loss. A formed ridge on the column's face provides additional steel surface area, increasing cross-section strength and rigidity. Full diagonal and horizontal bracing provides increased frame rigidity. All-tubular bracing offers greater frame strength. Over 44 times more torsional strength than open sheet metal channels. Heavy 10-gauge footpads are welded directly to the uprights, dispersing the column load more efficiently than conventional lighter footpads. A formed ridge on the footpad allows for easy nesting of shim plates. Multiple anchor holes on footpads, allowing for re-anchoring. Footpads are flush with the column's side, allowing for full "seating" of floor level load beams. Welds between braces and column are full fillet welds, providing more strength than spot-welds. Over 4" of weld is used on each end of every horizontal brace. Step beams feature a 1-5/8" step for decking or pallet support bar positioning. Constructed of high-strength (55,000 p.s.i. minimum) steel. Capacities are based on minimum steel strength, not the average. Actual capacity for the beams is equal to or greater than listed capacities. Step beams are constructed of continuously welded structural tubing. There are no ledges or cracks to catch pallets, trap moisture or debris. 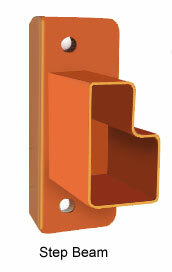 Load beams with structural channel construction offer extra durability. Channel beams are constructed of high-strength (50,000 p.s.i. minimum) steel. Capacities are based on minimum steel strength, not the average. Actual capacity is equal to or greater than listed capacities. Full filet vertical welds are much stronger than spot welds. Adjacent beam levels utilize common hardware reducing the number of nuts and bolts. With the strength of bolted connections, separate safety locks are not needed. Connections can be made quickly with standard tools, reducing installation, time and cost.